Indoor plants have gotten a bad rap and are often associated with dusty and dowdy African violets, languishing philodendrons, and bloom-free orchids. No longer! It’s time for plant lovers to dust off their houseplants, update their image, and discover just how exciting, trendy, and crucial plants can be in the home. 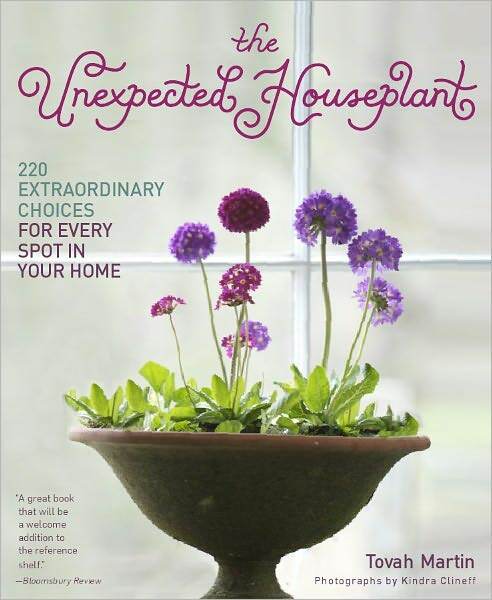 The Unexpected Houseplant, by renowned plant authority Tovah Martin, isn’t your typical houseplant book. Martin’s approach is revolutionary – picture brilliant spring bulbs by the bed, lush perennials brought in from the garden, quirky succulents in the kitchen, even flowering vines and small trees growing beside an easy chair. Along with loads of visual inspiration, readers will learn how to make unusual selections, where to best position plants in the home, and valuable tips on watering, feeding, grooming, pruning, and troubleshooting, season by season. Martin also brings an evangelist’s zeal to the task of convincing homeowners that indoor plants aren’t just a luxury – they’re a necessity. In addition to the design flair they add to a home, houseplants clean indoor air, which can be up to ten times more polluted than outdoor air. Comprehensive, up-to-the-minute, and illustrated with gorgeous photography by Kindra Clineff , The Unexpected Houseplant is for beginners, green thumbs, decorators, and anyone who wants to infuse a bit of surprising green into their décor.